The Onondaga Lake cleanup team includes Honeywell, Parsons, O’Brien & Gere, Sevenson Environmental Services, Infrastructure Alternatives, de maximus, and Anchor QEA. 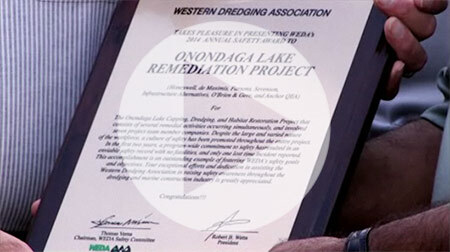 To see a video about the WEDA Award and the Onondaga Lake cleanup team’s commitment to safety, click here. 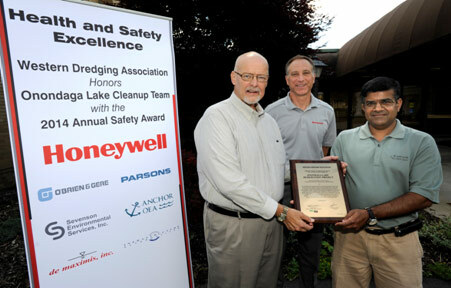 President/Chairman of WEDA Ram Mohan (right), presents the award to Honeywell Director of Remediation Design and Construction William Hague (left) and Honeywell Syracuse Program Director John McAuliffe (center). 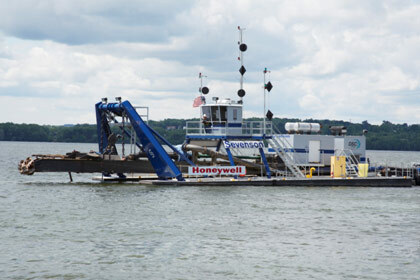 “Honeywell has really emphasized health and safety throughout the Onondaga Lake cleanup project. The work and attention to safety has paid off not only for the community, but also for the workers and the people that have been involved in this project,” said New York State Assemblyman William B. Magnarelli, pictured above (right) with John McAuliffe. WEDA cited a culture of safety that has been promoted throughout the entire project, noting that in the first two years of the dredging project, a programwide commitment to safety has resulted in an enviable safety record with only one “lost time incident” reported. The award covered more than 874,000 hours of work, over two years. A culture of safety has been promoted throughout the entire Onondaga Lake cleanup program. 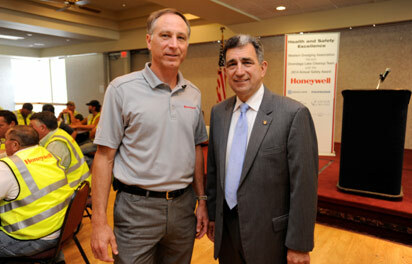 All new employees receive a site orientation; every project meeting begins with a safety moment; site safety audits are conducted at regular intervals; and Honeywell sponsors safety events for the entire workforce. At the end of July, the Onondaga Lake dredging project was 83 percent complete. It is on schedule to be finished by the end of 2014, with capping to be completed in 2016. 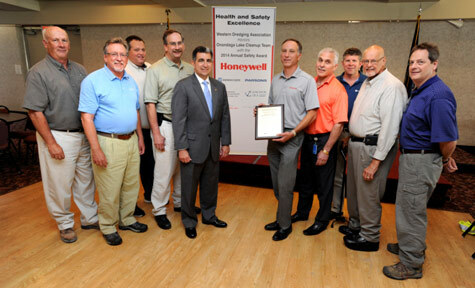 “Our team has worked hard to conceive and execute this project using sound science, partnerships with national and local experts, and efficient regulatory oversight,” said Honeywell’s John McAuliffe. 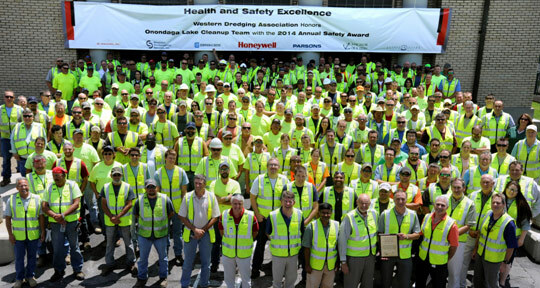 “WEDA’s recognition of the Onondaga Lake team’s outstanding health and safety practices and its exemplary record is a reflection of the team’s commitment to achieving a sustainable lake remedy while working in partnership with the local community,” said Honeywell’s William Hague. McAuliffe and Hague are pictured above with Onondaga Lake cleanup management team members, pictured left to right: Bill Cretens, Infrastructure Alternatives; Joe Detor, Anchor QEA; Mike Crystal, Sevenson Environmental Services; Paul Blue, Parsons; New York State Assemblyman William B. Magnarelli; Larry Somer, Honeywell; Chris Calkins, O’Brien & Gere; and Bob Rule, de maximus. WEDA is a member of the World Organization of Dredging Associations and covers North, Central and South America. WEDA is dedicated to the exchange of knowledge in fields related to dredging, navigation, marine engineering and construction by sponsoring or co-sponsoring national and international technical conferences, seminars, and symposiums, including publication and dissemination of the proceedings.